We've had such a good response from of our Bilstein Front Coilover System we worked tirelessly for 2 years to bring you the complete package - Introducing our Bilstein 3-Link Coilover System. 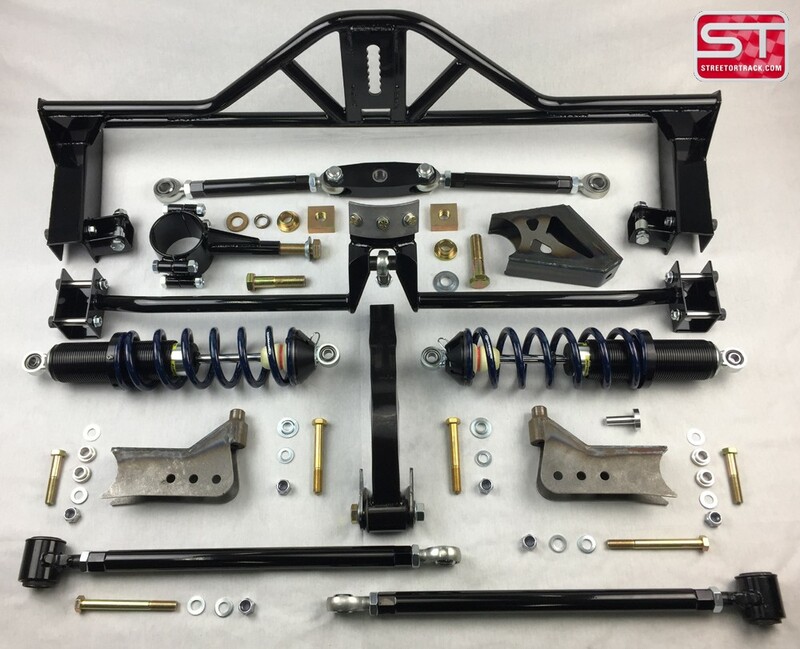 This huge step forward in rear suspension technology for your 65-73 Mustang completely replaces the heavy and non-adjustable leaf springs and stock type shocks with a fully adjustable, modern system. Rear end positioning is easily adjusted forward, backward, side to side and up and down. Ride height changes and corner weighting are a snap to adjust and transform the car into a balanced, corner carving machine. Custom valved Bilstein shock absorbers and industry leading Hypercoil springs give you exceptional ride and control from your classic Mustang. New! Our new double adjustable shocks are like 3 shocks in 1. Set both adjusters at #1 and you have our Street valving, both at #5 and you have our Sport, both at #10 and you have our Race valving! Now compatible with rear exit exhaust! Easy installation. Our Watts Link Frame and 3rd Link Frame bolt into the frame rails and transmission tunnel. 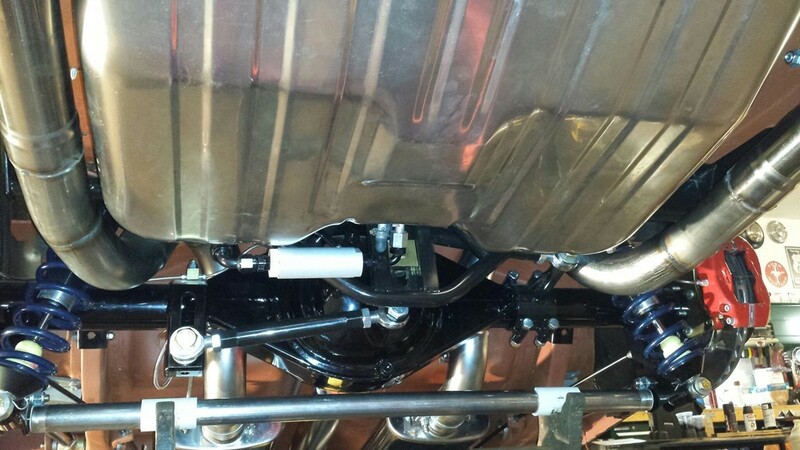 Rear trailing arm brackets and rear 3rd link brackets need to be welded to the housing. We designed our system this way so you can bolt the frames into the chassis and then if you cannot weld you can take the housing somewhere to someone that can. Its easier to take a housing somewhere than the chassis! 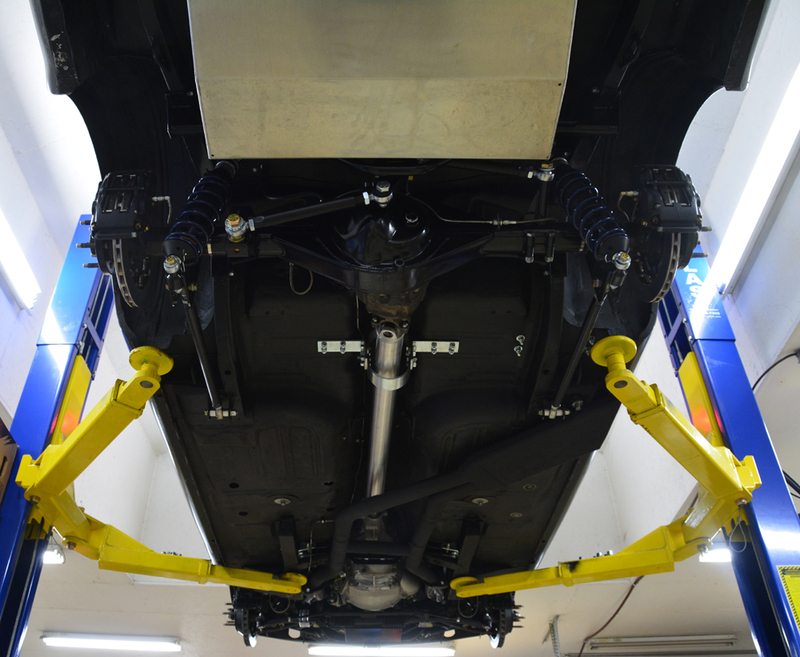 Purchase one of our Full Floating 9" Rear End Systems at the same time as our 3rd Link System and we'll fixture and weld all the brackets in the correct spot. 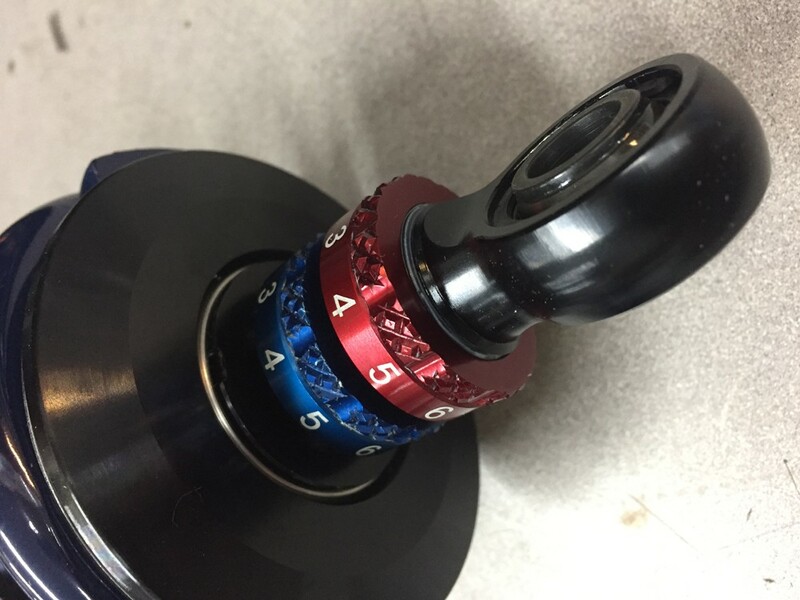 If you wish to use the conventional axle design, we have you covered there also, you can order one of our 100% new 9" housings with Torino bearing ends. Easy ride height adjustment. Our shocks feature a threaded sleeve, simply rotate the adjuster with the supplied wrench to raise, lower or cross weight the car. No cutting springs, no guessing. 1:1 motion ratio allows use of lighter springs and more shock motion for improved control. 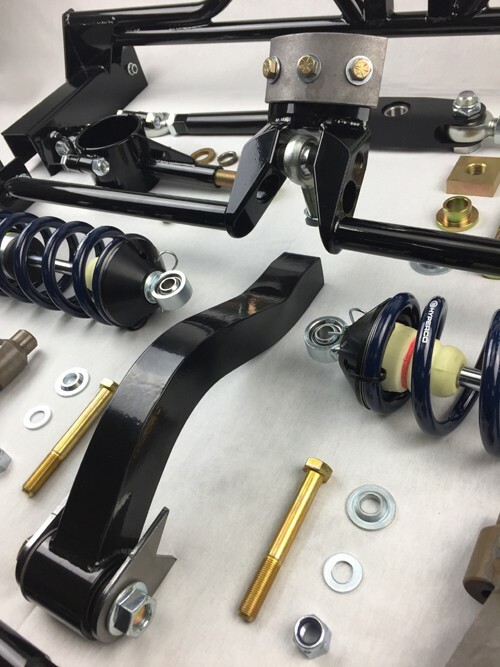 Although we have chosen what we feel and have calculated to be a great combo, coil over springs can be had in 25-50lb increments which is a vast improvement over the conventional spring offerings. We've designed our system to feature super easy spring/shock removal. The entire spring/shock assembly is held on by 1 bolt on the top and 1 bolt on the bottom. No spring compressors, no swearing. Monoball bearing shock ends further reduce bind found in stock setup. This transmits road forces directly to the spring & shock allowing it to do what its designed to do and get the tire back on the road quicker for more control and better handling. 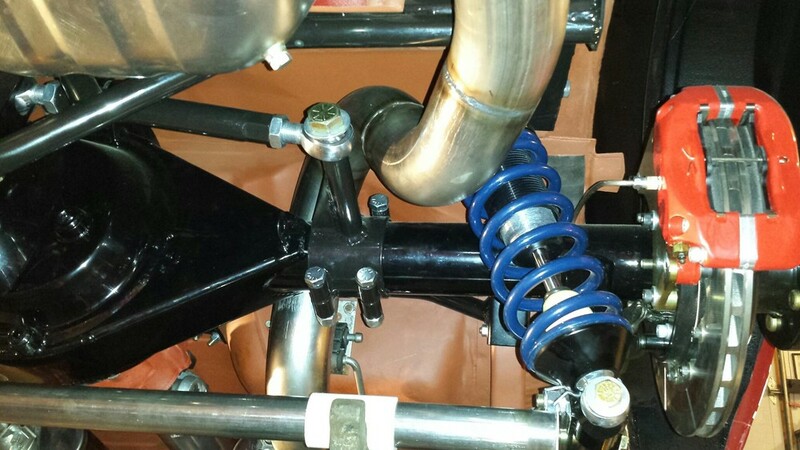 Other systems on the market that use rubber or polyurethane shock bushings will bind during regular suspension travel and slow down the shocks reaction to bumps. Our billet 3rd Link Bearing Support installs inside the transmission tunnel and enables us to achieve a longer 3rd link than the S197 Boss 302. 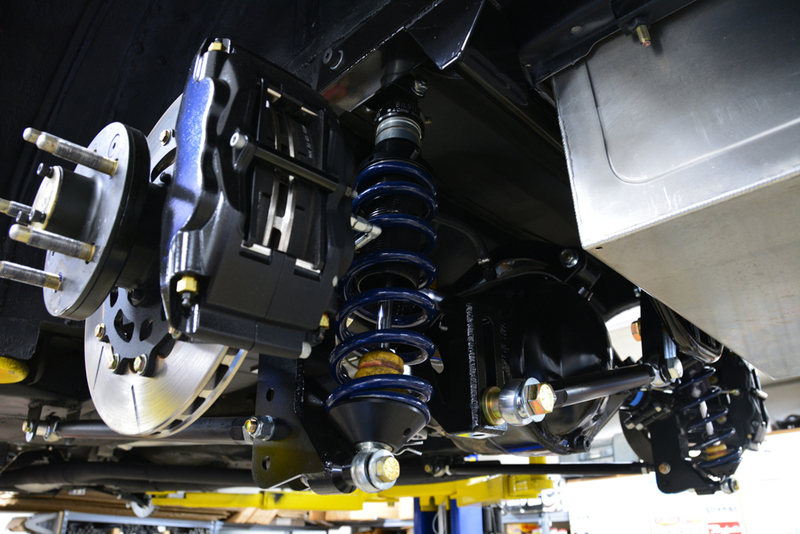 Complete Bilstein 3-Link Coilover System is 30lbs lighter than the leaf spring system we took off our 66 test car. 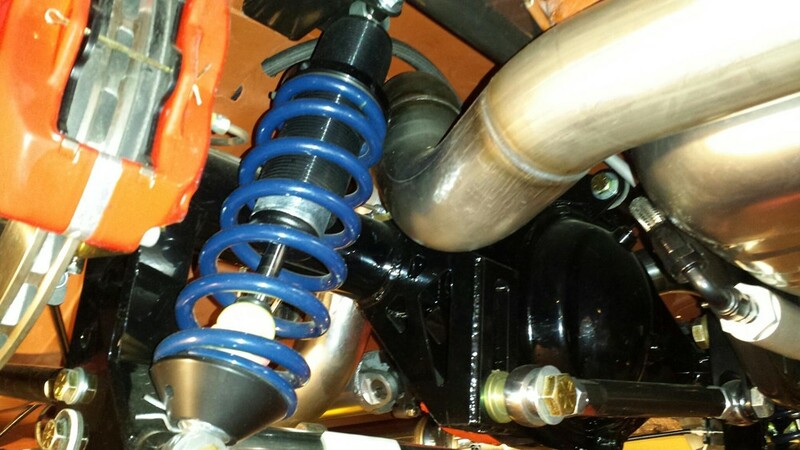 Shock valving and spring rates are matched to our front Bilstein Front Coilover System. When you equip your vehicle with both systems that are designed to work together, you'll achieve a superbly balanced chassis. View many more installed pictures in our Customers Cars section on our Facebook page. Just like our Bilstein Front Coilover System, we worked for a full year (in fact the testing and development never ends) computing motion ratios, wheel rates, sprung and un-sprung weights, critical damping and a massive list of other variables to design our own proprietary Street, Sport and Race shock & spring combinations specific to the 65-73 Mustang and other vintage Fords. We do NOT use a standard 'off the shelf shock' that simply fits in the space and 'sort of feels right'. Each shock and spring package is designed based on the vehicles weight and intended use. Alongside the year of math, shock curves and shock dyno time we drove many, many street miles and 100's of laps on our favorite racetracks for a real world 'seat of the pants' validation of each combination. We feel that this combination rides as close to a modern production car as you are likely to get from your classic. That was our goal and we feel we've met that. Choose this system if you want a smooth yet responsive ride from your classic that you can drive for hours and hours without feeling beaten up. 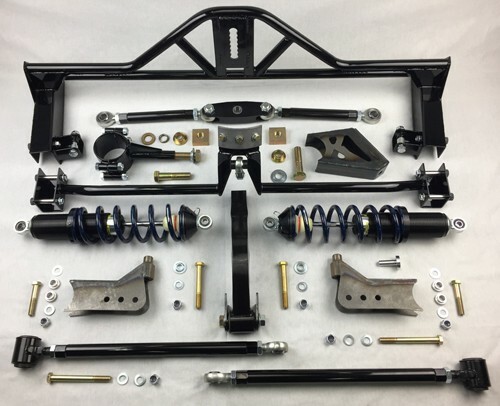 We worked really hard on this package to design it for all those dual purpose street or open track cars out there. This package gives a smooth, crisp, controlled ride on the street but can also handle bouncing off the curbs and sticky tires at the road course. Choose this system if you like carving around bends, on/off ramps and/or open tracking with NO need to switch shocks or click gimmicky knobs. For our race setup, the shock gets switched for one with a Schrader valve to adjust/set nitrogen pressure. With a shock inflator gauge like #LON50473 and a tank of nitrogen from your local welding supply store, this enables the customer to change gas pressure beneath the dividing piston. Choose this option for a dedicated track car. This valving can also be built into a Bilstein shock without the Schrader valve should you not wish to have the option to tune gas pressure but still want the race setup. 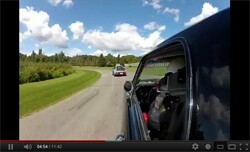 A lap of Road America showed this setup was 3 seconds faster than the Sport! Beaten on around Road America, Gingerman Raceway, Waterford Hills and Autobahn Country Club this setup is quick and very durable. Watch how easy the installation is. 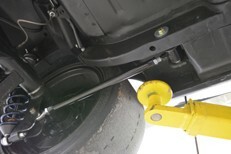 Stock leaf spring hole - quickly and easily install the trailing arms into the stock forward leaf spring mount. 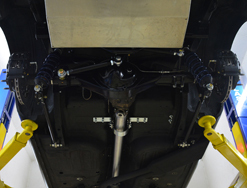 Frame rail mount - lowers and lengthens the trailing arms which improves the Side View Swing Angle by 51% - reducing pinion angle change during suspension travel. Requires welding brackets to chassis. Also compatible with mini-tubbed cars - contact us to learn specifics. 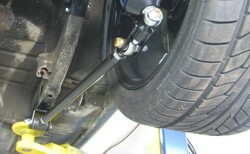 Street or Track Watts Link - bolt in design, multiple positive roll center height adjustment points. 3rd Link frame - bolt in design, billet 3rd Link bearing support. 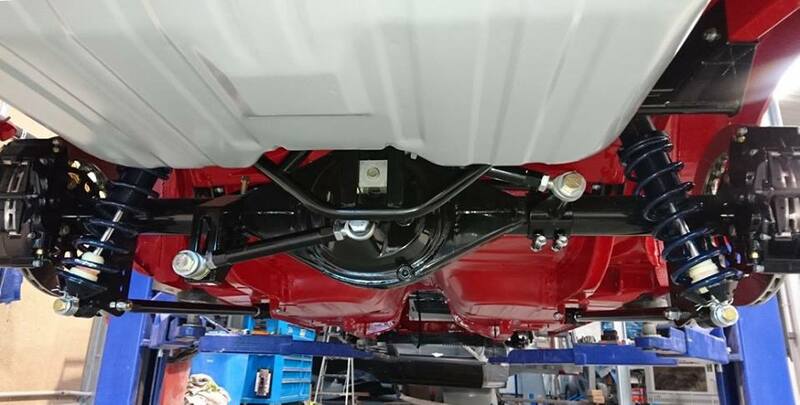 3rd Link - press formed from a single piece of material eliminates failure points, contoured to follow the trunk floor to allow maximum clearance for lowered cars. Custom valved Bilstein coilover shocks fitted with shaft mounted bump stops, thrust bearing washers and Hypercoil springs. Optional double adjustable shocks available under the drop down menu below. Set the rebound and compression at #1 and you have our Street valving, set both at #5 and you have our Sport valving, both at #10 and you have our Race valving! Feel free to play anywhere in between to tune the ride how YOU want. 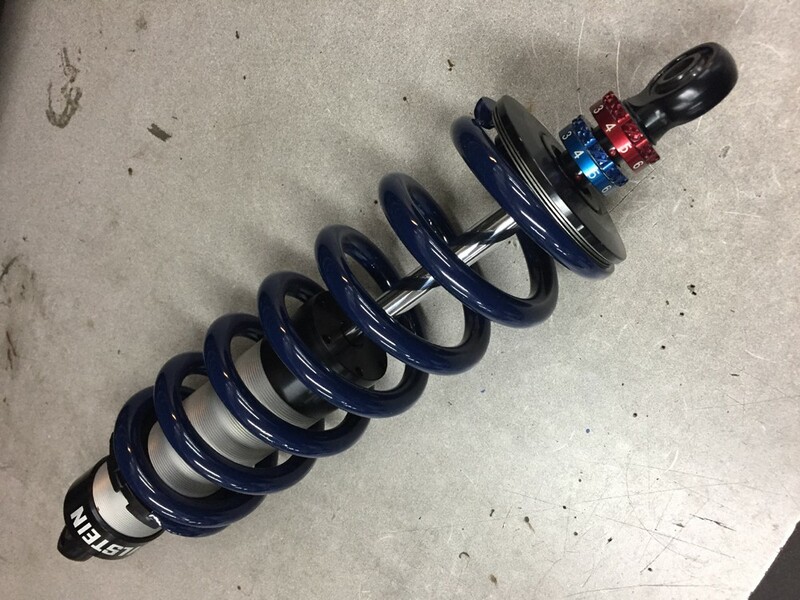 This all aluminum shock body w/spring is 1.6lbs lighter than our standard steel bodied Bilstein shock assembly and features ride height adjustment threads on the body instead of a separate sleeve. The aluminum body will lower un-sprung weight and shed heat quicker for longer lasting high performance. Hardware required to install the system. Spanner wrench to adjust ride height. Our upper 3rd Link spans from the third member to the transmission tunnel. A slight increase in gear whine inside the cabin may be noticeable. To reduce noise Hushmat or other sound reducing products can be applied on the floor under the rear seat. 1969 - 1973 cars will require use of our trunk box (see pictures HERE and HERE). Once installed this box is behind the rear seat and provides clearance for the 3rd Link at full compression. All parts supplied as well as instructions. Stock fuel line may have to be re-routed in some applications. Drop in Mustang Fuel Safe fuel cells will need the standard front fuel outlet reconfigured to clear our Watts Link frame. Please see our how to. If you don't have your cell yet, ask about our custom made Fuel Safe fuel cells. Up to 3" rear exit exhaust is possible but will likely need to be fabricated as a 'off the shelf kit' may not fit with clearance. Any good exhaust shop can build this. 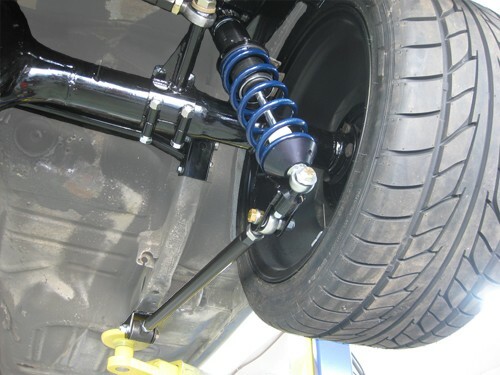 Cars with factory staggered shocks will need to modify the Watts Link frame and possibly the shock bracket to install the frame in the required location. I wanted to let you know that the 3 link setup bolted right in! From an installation standpoint, you did a very good job engineering the system. Man, that stuff looks tough. Industrial bling!! Manly! That is the nicest finished product that I have ever gotten from anyone selling aftermarket mustang go-fast goodies. Hands down. I had a hard time breaking it loose. There are lots of places on my usual drive "around the block" where I usually start slipping and sliding. Not any more. Really hooks up on turn exit. Braking is better than ever - no hint of hopping. All of the leaf spring oscillations are gone. No more lurching at low rpm either. I think it is actually quieter than before too. Feels way more solid. I never changed the lengths of your trailing arms, just tightened all the jam nuts and everything is straight. Drives perfect, even freeway is good. Centering it was easy. Feels more solid than before, while being still more limber somehow. I had the opportunity to attend an SCCA Autocross school last Saturday (3/15/14) and really abuse the car! Overall the car performed great, the only problem was when it lost power steering due to a faulty control valve (time for a steering upgrade). As far as handling, the 3-Link really planted the rear end. There was no tendency to oversteer but it was very controllable to steer with the throttle. A few times I got the car into a very controllable 4 wheel drift and it just felt awesome! Way more balanced than I expected it to be for a maiden voyage. I can't wait to upgrade the front suspension now to rival the rear. I just returned from my season opening autocross event, got about 20 runs in today - I continue to be totally impressed with the performance on the 3-link. By far the best handling upgrade I've made to the car thus far. Awesome. The suspension is absolutely awesome! It handles like a new sports car. I cannot believe how well it drives and how much safer the car feels with it. I LOVE IT!! Thanks! I just wanted to say THANK YOU for the new setup. I finally got the car on its wheels over the weekend and drove it on the streets. The car handles amazing! My friend has a 1969 Mustang Convertible with original suspension setup and i think i have sold him on your coilover kit.